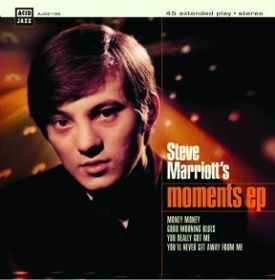 Following a “chance discovery in an east London attic”, Acid Jazz Records have put out some early unheard and unreleased material from Small Faces mod icon Steve Marriott‘s first band, The Moments. Marriott formed The Moments (originally The Frantiks) in 1963 at just 16 as an r’n’b band, and had a brief residency at the Flamingo Club. Despite playing 80 gigs in 1964 (and a strong mod following) commercial success eluded them and Marriott was dropped by the band. But last year The Moments’ bass player discovered an acetate from 1964 in his attic, and via Whapping Wharf’s John Hellier the recordings found their way to Acid Jazz. The two unheard tracks – ‘Good Morning Blues’ and ‘You’ll Never Get Away From Me’ – have been coupled with The Moments only original release, the US-only ‘You Really Got Me’/’Money’ single to form the 7″ EP, which comes in a ’60s-style picture sleeve. The two unreleased tracks are also set to be included on the forthcoming Acid Jazz long player ‘Rare Mod’, out next year. You can purchase the EP here. Visit the Acid Jazz website for more info.